By the time you see this I shall be away in Telford, at On Stage. 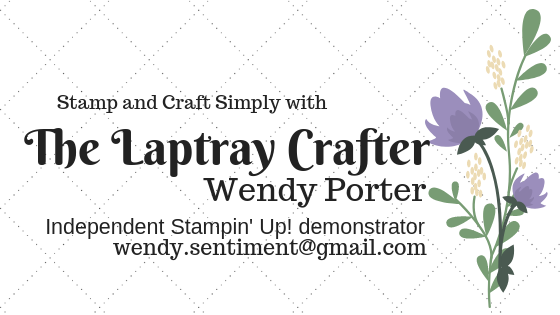 In case you don't know, one of the perks we get when joining Stampin' Up! is that we can attend one of the bi-annual conferences they hold. At these events we get spoiled rotten... we always get a lovely bag with a brand new stamp set plus there is usually a notebook and pen, plus other bits too. We get a lovely picnic lunch, we get to see the new products that will be in the new catalogue and during the day we have a crafting session... can you imagine what its like when there are over 500 crafting together..... wonderful crafting mayhem!! Ooo and during the day we win another stamp set and usually get another one too..... I cannot say how much fun it all is... tiring... but a very happy sort of tired, if you know what I mean. 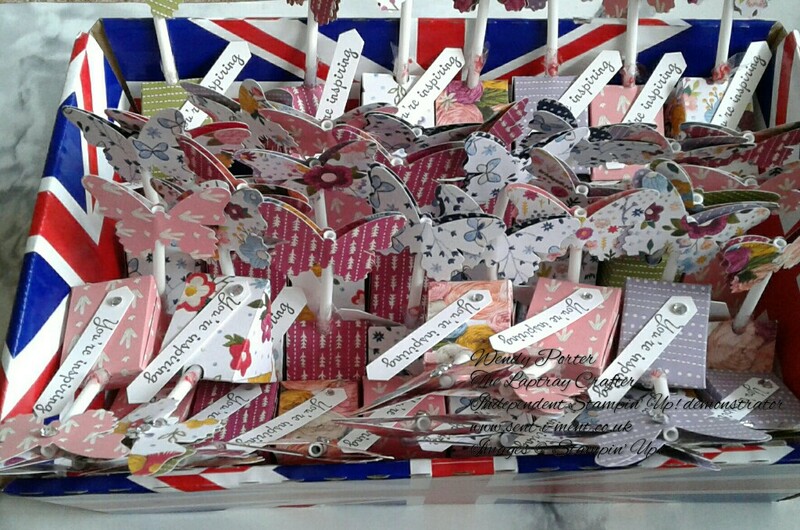 As well as all this, lots of us make little gifts and we swap them with other demonstrators that are there... its a fab way to meet up with old friends and make new ones too. Here is my swap for this On Stage.... don't they look cute... 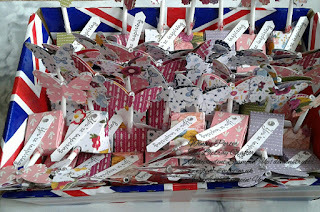 I hope everyone likes them, they hold a small fruit lolly. 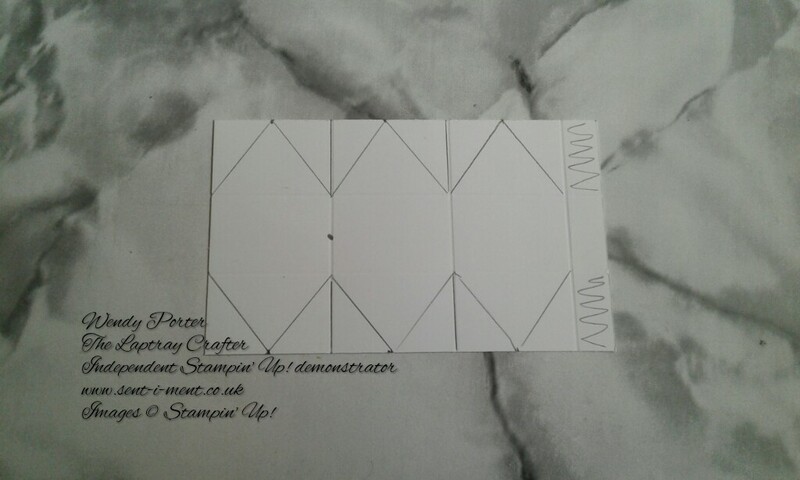 on short side, score at 1" and 2"
on long side, score at 1 1/2", 3" and 4 1/2"
on long side, mark at 3/4", 2 1/4" and 3 3/4"
On long side, cut along score lines to the horizonal score line, then cut each flap to make a point at half way point and cut off the little rectangle at the end. Fold on all the score lines. As I was putting a lolly in each of mine, I punched a small hole in the middle of one of the score lines. 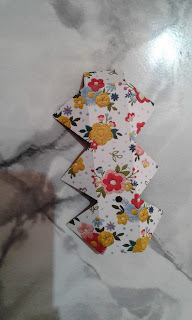 Fold together and glue (don't forget to fill first though), then attach a punched out butterfly on visible lollystick and decorate. 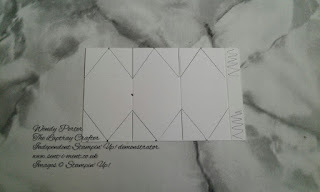 I also attached a little description of what I used to make them on the bottom, but you don't have to do that.